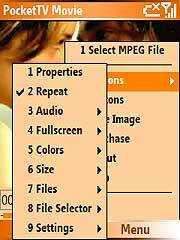 This section describes how you can make HTML links to locally stored MPEG files. Taping such a link will cause PocketTV to play the movie file. When playback is completed PocketTV brings you back to the web page. 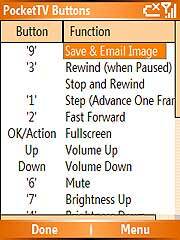 You can also terminate playback by taping ok in PocketTV. On Pocket PC, due to a bug in PocketIE, HTML links to locally stored media files (.mpg, .mp3, .wma or .wmv) do not work well. For more on this problem, please read this newsgroup thread. Basically the .m1u extension is associated with PocketTV, and when PocketTV gets a .m1u file, it looks inside the file for an MPEG stream URL or local file name. 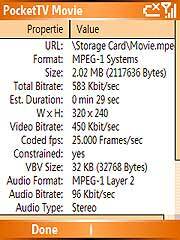 If the .m1u contains the full path name of locally stored MPEG file, PocketTV will just play this file. You do not need any extra Storage Memory: the .mpg file will not be duplicated or copied in Memory if it is already stored as a local file (e.g. in main memory or on a Storage Card). Check this forum thread for more on this subject. This section describes how you can make HTML links to MPEG files located on remote servers. Taping such a link will cause PocketTV to stream the video. When playback is completed PocketTV Enterprise Edition brings you back automatically to the web page (you must close PocketTV Classic to return to the web page). You can also terminate playback and return to the web page at any time by closing/minimizing PocketTV (just tap (x) in the NavBar). Requirements for streaming: In order to do streaming with PocketTV, you must have device equiped with a high bandwith (>= 500 Kbit/sec) wireless internet access (e.g. iPaq with with a 802.11 WLAN card with a hub well connected to the net). You need PocketTV version 0.3.14 or later (see Release Notes). Basically the .m1u extension is associated with PocketTV, and when PocketTV gets a .m1u file, it looks inside the file for an MPEG stream URL or local file name. If the .m1u contains the http URL of an MPEG file, PocketTV will start streaming the video from this URL. In order to stream with PocketTV, the MPEG file must be located on a Web Server that has been configured to enable PocketTV streaming (see next section). You do not need any extra Storage Memory: the .mpg file will not be downloaded in memory, it will just be streamed. You can also tell PocketTV to stream directly from a URL that you enter in the "Open URL..." dialog. PocketTV is capable of streaming from standard HTTP/1.1 servers, so all you need is an off-the-shelf web server, like Apache. You will have to restart the web server after changing the configuration. If your web server is not configured properly, it may send the .m1u file with a wrong type (e.g. text/plain). This might cause PocketIE to display the content of the file, rather than initiating the streaming. You can check that your server is correctly configured by issuing an http GET request manually, using telnet on the port 80 of your server. Note: .m1u files are only understood by PocketTV. If you use dynamic HTML, you can detect the type of client (browser) that accesses your web pages. If you detect PocketIE, you should generate PocketIE friendly pages and include the .m1u links for streaming your MPEG video content.